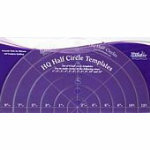 This template set of half circles are easy to grasp and control and come in 1" increments Template Sizes: 1.5" to 11.5" for quilted circles from 2" to 12". Scored lines make aligning easy. 1/4" inch thick high quality acrylic, insures safety when used with a hopping foot. Use with any brand mid arm or long arm quilting machine.